The sixth issue of Black Seed Journal will continue an effort to challenge and expand the meanings of both Green and Anarchy. As editors and contributors, we not only wish to reject notions of the state and capitalism, but seek perspectives that are earth-focused, unexpected or inhuman. The vision of nature as gentle nurturer is predicated on the same conception of the earth that the Conquistadors held when they came to the New World, to rip into the Virgin Mary’s flesh and freely take from her. 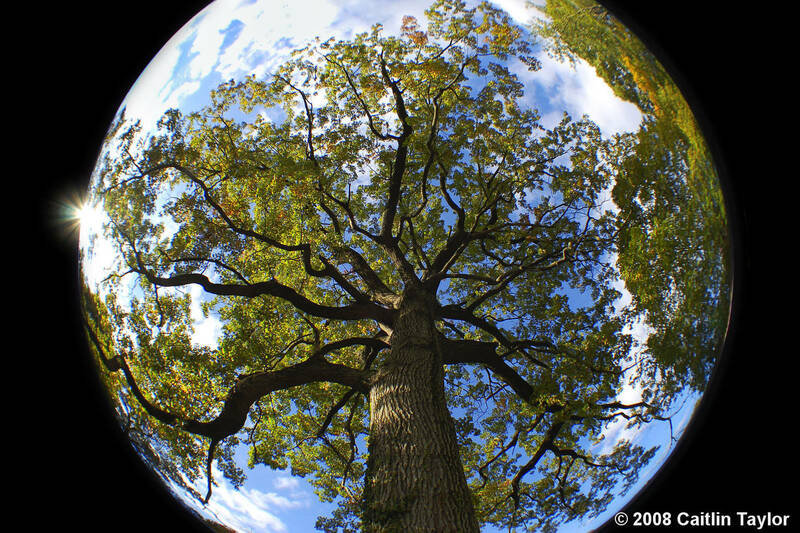 Seeing the earth as merely fertile and passive denies the true power of the Mother. Like a toddler who defiantly casts his blocks on the floor, we at once valorize and mourn the mess we have made, when actually we are small, fragile things amid the vastness of cosmic forces. However, there are other visions of the Mother— visions that acknowledge that the ability to create life is inseparable from the ability to inflict pain and death. Kali, Medea, Ixchel, Tiamat, Spider Woman and countless other Mother Goddesses throughout the indigenous world show us visions far more nuanced, brutal and rich. The Mother is beauty, but also terror. She is love, as well as annihilation. She gives and takes, not as her brood requires, but as her mysteries dictate. The binary of the Fearsome Sky God and Sweet Mother Earth is a historical fallacy. If we seek to speak of the earth, let it not be in language perverted and twisted by narrow-minded gender ideals, but in language that rejoices in the cruel glory of the natural world. The theme for Issue 6 is the wrathful Mother, violent maternity, or the blood-drenched Queen. It will have a print run of at least 5,000 but possibly 10,000 as well as be published online (eventually). We are open to all written forms. Please email blackseed@anarchyplanet.org with inquiries or submissions. You can snail mail us c/o Little Black Cart PO Box 3920 Berkeley CA 94703. Perhaps you thought we were gone? Two years feels like an eternity in these fast-too-fast times when epic conflicts have a full arc over a weekend, 140 characters creates volumes of commentary and opinion, a day seems like forever when you are refreshing a screen over and over. This project is the opposite of this spirit. 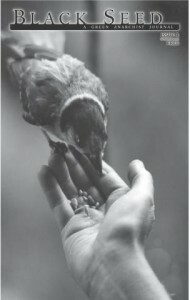 Herein we hope to share themes that are fuller in scope, that merit reflection and contemplation. We intend to plant seeds and to care for them as they flower, mature, and decay. The half lives of our pleasures, concerns, and conflicts should be measured in decades and not in the blink of someones eyes or even the length of time the average radical stays active. Welcome to issue five of Black Seed. If you have not seen or heard of us before let us introduce ourselves. We are a small collective of green anarchists who publish a paper-only (or at least paper first) publication intended to broaden and intensify our perspectives. We differ from green anarchist positions that precde us because we have a deep concern about positive political programs (however they are dressed up), the ability of our people to achieve them, and the efficacy of a revolutionary mindset in the first place. Pointedly, we feel as though the academic arts (anthropology first among them) are too mired in the gauntlet of what it takes to become a practitioner to take seriously. This is not to say that we aren’t willing to learn about people, the past, or whatever but that the citation of sources, and the othering of people or their superior lifeways is not how we believe a green anarchist perspective begins. But it does begin, mostly by conversations with each other, with people who may also be anarchists but don’t use the term. Our experience is that those who are most likely to share our attitude towards an earth first, anti-authoritarian, and anti-ideological perspective are people who are also indigenous. Indigeneity is a confusing smear of bodies, practices, and conversations that we know will continue to inform Black Seed. This issue dwells on these building blocks. New editor Ramon and I write new manifestos contemplating what it means to be a green anarchist in a post-manifesto age. What does it mean to have a politics of pacing and contemplation rather than one of being in such a hurry all the time. What does it mean that the world is coming to an end, forever. Finally but perhaps most importantly what is the role of violence in our movement (cough) today and in the ushering of a new one? Anarchists have always been the party of imagination but also of morality. Violence cuts through both of these gordian knots but to what end? These are the questions that are attempted to be answered in issue five of the Black Seed. You can get a copy of our paper at Little Black Cart. You can also get 50 or 100 copies for the price of postage. dangerous ways they’re minimized by government agencies and popular media, as well as our total lack of collective responsibility, demonstrated by our increasing consumption of finite resources. Our world has gone mad with profit-for-the-very-few and the political and social consequences of a world with as great a gap in income levels as there has ever been are dangerous. How will the next economic crash look compared to the 1930s? Will it take another war to end the next one? Can we survive such a war? Finally, is the end of the world visible in how we allow ourselves to be treated by the State? If Black Lives Matter has taught us anything it is that the human capacity to objectify and destroy other humans is as high today as it has ever been and that the rhetoric is even more sophisticated (and not) and even less forgiving. If the end of the world is a measurable event there is plenty of evidence that the meter for it is at a near high. But if we were to predict what is going to happen we would not predict a technicolor, end-of-the-action-movie, discrete end of the world in our lifetime. What we would predict is instead something of a whimper. We would argue that the end of human progress looks like a thousand Space X capsules failing to make orbit, islands in South Asia disappearing, and the infamous air pollution in Bejing. The headlines will continue to scream about the end of the idea that humans are capable of thinking and acting in big and successful ways about our own possibilities. We will slowly starve. The end of the world—just like ideas of human perfectibility or our progressive future of reasonable solutions to logistical problems—should be seen for what it is: a construction of the amazing myth machine of the particular society that we live in. Our four horsemen will not come with scythe, sword, arrow, and scale. They will just come with less: less resources, less political stability, and less capacity to see a way out. This is because ultimately what we call the end of the world will merely be the end of this particular humanist society, the end of a Western Civilization that spans the globe, the end of Global Capitalism™ as we know it. It may be the end of neo-Rome but it isn’t the end of us. The problem we face is: who are we without the world as we understand it? Are we preppers whose future vision is limited to fences and feeding our (homogenous) children? Are we parochial victims of future strongmen as prefigured in so many movies and books? Or are we something else? If rewilding has been worth anything in green anarchist thought and practice it’s been engaging as an intervention into this question. But along with gaining skills we also need to seriously reassess how we associate with one another. Perhaps it is too late for city dwellers, who appear to be no longer capable of caring for one another even in today’s world. We have plenty of examples of what co-existence can look like, what forms cooperation and mutual aid have taken, but we experience its impossibility in our daily lives. Perhaps the lesson we should draw from the upcoming Great Whimper is that we have serious work to do regarding the depth and sincerity of our interpersonal relationships. Other people may not save us but they do sometimes make surviving on less seem like thriving on more, a lesson that becomes more and more obviously necessary, as we have experienced excess and it has turned out to be less desirable than we could have imagined. You can order bulk copies of Black Seed online from LBC. Please write to us at the addresses listed below for any further inquiries regarding subscriptions. An interview with Corrina Gould, a Chochenyo and Karkin Ohlone woman from Oakland, talking about the history of indigenous people in the Bay Area and several recent actions she has been a part of. 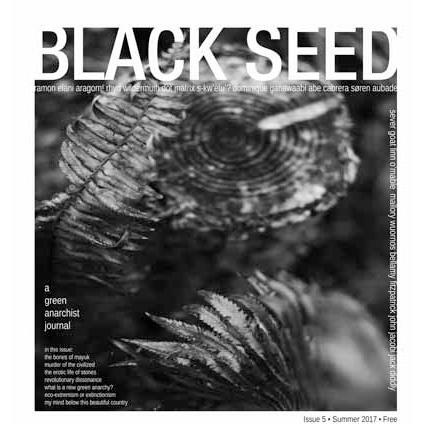 Black Seed is a bi-annual green anarchist, submission-based publication. We are a conversational project meaning that our goal is to help facilitate face-to-face conversations based on submissions we have received and curated into a printed publication. Taking steps away from Internet culture feels integral to this project, though sadly, as you are likely reading this on a screen, we know too well it is a process for many of us to learn and re-learn. Exciting as printed words may be, we admit these ideas and experiences are largely born out of coping with the symptoms of civilization. So we ask you to share how you cope and critique, how you have tried to run away, how you have battled the demons of domestication, and how your heart pines for something new. Over the past year, we have explored continuing themes of spirituality, roles (if any) of anthropology in green anarchist thought, anarchist indigeneity, eco-defense in the US, to name a few. The main articles from Black Seed Issue #1 can be found here: http://blackseed.anarchyplanet.org/2015/01/07/content-from-black-seed-is…. We’ve heard various murmurs of the paper, and wish to see more engagement with the ideas and stories. Consider this an invitation to the discussion. We are both looking for a continuance of conversations underway and excited to welcome new topics. Deadline for Issue #3 is February 1st. Black Seed, PO Box 68271, Grand Rapids, MI, 49516. Interview with Klee Benally by Aragorn! The story Voice From The Grave, along with the other articles from Black Seed Issue #2, will be available to read online upon the release of Black Seed Issue #3. Black Seed Issue #2 has arrived from the printers and is available for bulk mail-order through Little Black Cart and soon to be available throughout the U.S. at various bookstores and social-spaces. We are excited to present you with another publication of green anarchy, a continuance of some of the conversations started in the first issue and stirring up new conversations that we stated were part of our interests in our initial announcements. -Answers To Questions Not Asked: Anarchists & Anthropology by Aragorn! We also have two events coming up this weekend in the Pacific Northwest to celebrate and discuss this issue. Some of the editors will be present to discuss Issue #2, our haters, our hated, and so much more. The originally intended deadline for submissions for Issue #2 of Black Seed is a couple o f days away, and while we’ve got quite an amount of material to work with, we also know of a handful of potential contributors who’ve yet to get some writing to us. Next week we’re going to start piecing together artwork and submissions for our second release, but we wanted to give a little bit of a grace period to those who might still be working on their submissions. This summer seemed to have been an incredible incubator for Black Seed. Something indeed has sprung, and with autumn fast-approaching we will see how these things may harden up for the winter. That being said, the official deadline for submissions has been pushed back to September 15th. The sooner we receive your submission however, the better chance there is that we’ll be able to fit it into this issue. The first issue of Black Seed has been finding its way around anarchist circles since its birth this spring. The copies, intentionally passed between hands and not read through screens, has inspired disagreements, praise, scoffs, and most importantly: dialogue. Our expectations as editors were varied, but the response to our first issue convinced those most skeptical that the anti-civilization conversation is far from over; indeed it’s not even the same conversation that was occurring when Green Anarchy ceased publication in 2009. There is yet so much to be said. We’d love to hear new and different voices from the choir sing. So if something in the last issue stirred you, or even if you were disappointed that nothing did stir you, don’t wait for someone else to write the articles you want to see. Indeed, be the change you wish to see! One topic that has been sparked with some controversy in Black Seed has been the idea of hope; abandonment or pursuance? As always, we’re not looking for one answer to that question, nor to gather all on the same side, but rather dive into disagreements, conversation, and incitement. May Black Seed be that sea! The deadline for Issue II submissions is September 1st. I had arranged an interview with arguably the world’s most prominent anti-technology philosopher via email. The interview was to be conducted via Skype. At the appointed time, Zerzan’s voice leapt across the continent—from Eugene, Oregon, to New York City in the fraction of a second. He was smiling when his face flashed onto the monitor. I smiled back and looked into his eyes—before catching myself. The irony of Skype, of course, is that in order to actually make eye contact with someone, you have to ignore their eyes and look into the camera instead. Sure, you unplug and connect with nature. It’s one thing to write about it, but you need to be out there in it too. Were not going to have a transition [to a hunter-gatherer existence] until we learn how to do without technology and civilization. There are practical things that need to be tackled. I think so. They say that if one satellite fails then they’ll all start falling. But, that doesn’t mean that people wouldn’t go ahead and try and put everything right back up again. So, when did you have your epiphany about all of this? No. I don’t think so. The trans-humanists say that if we just have more technology, we’ll have a quantum leap and everything will be OK. We will solve all the problems. We will live forever. Well how is that working out so far? We’re seeing the collapse of the global environment. We have these mass shootings. “We’re all connected,” they say, but we’ve never been more disconnected from each other in history. So, you want to be connected and the trans-humanists want to be connected too. Is it possible that you’re both striving for the same idea of utopia? So, there’s definitely idealization on the part of many trans-humanists, though [Unabomber] Theodore Kaczynski writes in his essay “The Truth About Primitive Life” that there is a lot of idealization of the hunter-gatherer lifestyle too. Do you have a response to that? Well, one thing Ted got right is that it does no good to create an idealized and romantic version of prehistory. But I’ll tell you one other thing, and it’s the reason why we’re not on terms anymore: He was fiddling with the sources, and that is not forgivable in my opinion. He deliberately took things out of context in a way that is dishonest to put it mildly. Well he’s got a very narrow focus. If it’s not anti-technology, it’s fucked up. But, I think the question is deeper. It’s about civilization. It’s about domestication. We lived for 2,000,000 years without civilization and people got along very well. I have to say this is the most speculative thing that I’ve written about. I’m not abandoning the argument, and I try to make a case for questioning symbolic activity even including language, but it’s much more clear in terms of time, and numbers, and art. What makes it so speculative is that no one knows when speech started. There’s no way to prove it. In my own life I’ve always had this acute sense of time. I don’t know why. I remember working in the fields picking strawberries as a kid. We would start working at 6 AM and there was a steam whistle that blew at noon. Well, I could always tell within seconds when that whistle was going to blow. It was uncanny and I took great pride in it. Another way to look at it is that I was so colonized by time, so ruled by it. Time has become a material thing. I think you could even say that our sense of time-consciousness is pretty much the best way to measure alienation. The ITS group is real slavish to Ted Kaczynski. I think it’s a little unfortunate. They even put out a slur or two on me. Why are they taking a little shot at Zerzan? It’s because I caught Ted cheating and they know that. Violent groups like ITS have already killed two people. So, yeah, they’re for real. How do you feel about anarcho-primitivist groups like ITS using technology to accomplish their aims? It reminds me of that old communist idea—that the state is necessary at first and then it’s supposed to become unnecessary and wither away. Of course, it never does wither away. It only gets stronger. That’s an interesting way to put it. Well, I just feel like we’re trapped in these contradictions period. If you want to call it hypocrisy, OK. I think about this a lot and I know there are people who feel that I have gone over to the dark side. That’s the number one question. How are we going to live? Were so de-skilled, how do we re-skill? Even something as far back as making stone tools, knowing what plants are edible. I mean, how anxious will you be to pull down civilization if you don’t know how to live without it? So, we have to start getting those skills. And, maybe it’s not just learning long-forgotten skills, but also learning to forget. Will we forget what stars are, for example? In the past, people would look up and they wouldn’t know what they were, and it wasn’t so much an absence of knowledge, but a presence of mystery. That really hits the nail on the head. Here’s a real quick little story. Some of us were gathering up in Olympia at an anarchist workshop and we overheard these people say, “Man these primitivists are crazier than we thought. One of them was saying that the earth is flat.” What [the primitivist had] really said, was that if you live in band society of 60 people, it doesn’t matter if the earth is round or flat. We look at this marvelous photograph of the earth taken from the moon. Here we are on this fragile little globe, but what did it take to get that picture? What kind of massive industrialization project did it take in order to have that one lovely picture? I think one very general way to look at it is division of labor. If you have a tool that anybody can make, that’s great. You’re in contact with it in a very sensual way. But, tools that require a hierarchy of coordination and specialization create a kind of distancing. That’s the kind of technology to avoid.